Pai Gow is actually a popular Chinese dominos game that was recreated by the Americans into a form of Poker, which is also known as Double-hand Poker. The game rules were created by Sam Torosian, which has become an entirely unique way of playing Poker. The game is based on standard Texas Hold’em hand rankings, but the gameplay itself is much different and more exciting. The game is played against the casino, meaning it’s not a game played among players. In a land-based casino, up to 7 players can enjoy Pai Gow Poker at a time whereas online variants have been known to provide a gaming opportunity for more players. The game has not been made available with live dealer options as it has not grown to be as popular as regular casino Hold’em Poker. To play the game is very easy, but there are a few rules that need to be noted before playing. The game is also famous for strategies as the winnings provide even money. Various bet options are available, allowing the game to be played by beginners and high rollers. 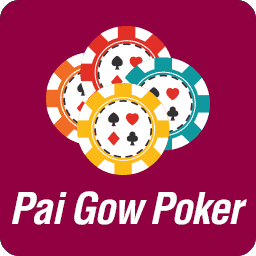 To become a professional at Pai Gow Poker, you would need to understand the Poker rankings and create the best possible hands that consist of 2 different piles. In this article, we cover all the most necessary rules and options of the game, while also giving players an advantage with the best strategies. Those of you who have tried playing the game will find there are a few things that set the game apart from regular Poker such as Hold’em. The first major difference is that you and the dealer are given 7 cards each and that a Joker card could appear within your hand. This is because the game is played with a regular deck of 52 cards and a single Joker. The Joker card can represent any other to complete a pair, straight, flush, or any other combination. Should a Joker be dealt to your hand, but no combinations are possible, the Joker will be used as an Ace, which is the highest possible card in the game. All other cards hold their face value and all face cards represent 10 values. Once you’ve placed your bet, you are given 7 face-up cards. The dealer will also have 7 cards, which are face-down. You are then required to rearrange the cards to provide the best possible 5 card hand and the best possible 2 card hand, in other words, you need to split the pile. The 2 card hand needs to be placed above the 5 card hand, after which the dealer will flip over his cards and hands will be compared. Keep in mind that your 5 card hand always needs to be stronger than the 2 card hand you’ve created. In other words, if you are dealt 2 Aces, and the rest of the cards don’t create any combinations, you cannot move the 2 aces to the smaller hand. In this case, you would need to take the 2 highest valued cards for the second hand and leave the aces to cover the 5 card hand. Should you be dealt a hand where 2 Aces and 2 Kings are involved, you would still need to leave the aces on the 5 card hand as it is the highest possible hand. However, the 2 Kings can be moved to the 2 card hand, which gives you a pair in both hands. The winning requirements are also different in this form of Poker as both your hands would need to beat that of the dealer to win. Once both your hands are on the table, the dealer will first compare the 5 card hand and then the 2 card hand. Should your 5 card hand be stronger than the dealer’s, but your 2 card hand is weaker, it will result in a push (no one wins). If both your hands are stronger, you will win 1:1 if the values placed on the table. If both your hands are weaker than the dealer’s, you will lose your bet. Royal Flush – This is a hand only possible with the 5 card hand as 5 successive cards are needed, which needs to include 10, J, Q, K, A, all of the same suit. This is the best possible hand in Poker. Players will also be able to use the joker to substitute for any of the cards needed. Straight Flush – Once again, this is only possible with the 5 card hand. The same requirements as the above are needed, but it doesn’t need to be the highest cards in the suit. For example, a straight flush can be all the same suit with cards values including 5, 6, 7, 8, 9. Four of a Kind – Four of a kind is available in the bottom pack only as players need 4 of the same cards. This can be of any suit as long as all 4 cards have the same values, such as K’s, Q’s, J’s, or any other card value. Full House – This is a tricky hand in Pai Gow Poker as it needs to have 3 of a kind and a pair to complete. However, if you send the pair up to the smaller hand, you decrease the value of the 5 card hand to 3 of a kind, which is much lower than a full house. However, if your 2 card hand is lower than the dealers, it will be a push. Flush – Flush is a hand that requires 5 cards with the same suit. The card values can be of any order as long as the suits are all of hearts, spades, diamonds, or clubs. Straight – A straight is also a 5 card hand and will require all the card values to appear in order such as 2, 3, 4, 5, 6. The card suits are not obliged to match, meaning the suits can consist of any values. Three of a Kind – Three of a kind hands can only be reached in the 5 card hand as 3 cards of the same face values are needed. Once again, any suits will do, as long as the cards all have the same value. Two Pair – Two Pair is a 4 card hand and includes 2 packs of 2 card combinations. For example, 2, 2, and 5, 5, is a 2 pair hand. However, if you send one of the pairs up to the 2 card hand, you will only have a pair in each hand. Pair – A pair is the second lowest hand in the game and simply consists of 2 cards holding the same value. This combination can be used in either hand against the dealer. High Card – High card is simply to beat the dealer’s high card if neither of you have any other combinations, which is common with the 2 card hand. Ace is the highest value possible, followed by King, Queen, Jack, 10, and all other cards consist of their own values. There are many ways to play the game, which includes both higher risk and playing it safe. The higher risk method would simply mean you create the best possible combination for the 5 card hand and put up whatever else there is in the 2 card hand. This way to you can ensure that the first hand will win while risking the second hand against the dealer. However, as long as you win the first hand, the game will be yours, or it would result in a push if the dealer wins the 2 card hand. The safer way to play is to divide your hands equally between the 5 and 2 card hands. This means if there are 2 pairs, you won’t leave both in the 5 card hand, you would take the pair with the lowest value and move it to the 2 card hand. This way you will win if the dealer has anything lower than you on both hands. Both of these strategies have their benefits, but at the end of the day, you will find a betting system provides the best results when combined with either of these options. Progressive betting systems such as Martingale or Labouchere can both offer great benefits, which all depends on your account balance and how much you would like to risk. Factors such as minimum bet and the table limits will also come into play here as it could limit your strategy. For example, the Martingale system increases your bet rapidly, and if you were to reach the table limit, you would end up losing a huge chunk of your cash. For low table limits, the Labouchere system would work a lot better as players have more control. This is a very easy to use system that provides great benefits. All you need is a notepad where you can keep track of your winnings and losses, which also provides you with the information needed for the next bet value. Start off small and build confidence in the system before increasing values. For example, start with a row of eight 1’s on a page. You need to add the first and very last numbers of the row together for your next bet, which would be 2 in this case. If you used other numbers such as (23212342), your first bet would be 4 units. A single unit needs to have a value of your choice, which is once again recommended to have a low value at the beginning. For example, if one unit is £1, it would mean your first bet is £2 on the row of 1’s. Once you’ve placed this bet and won, you will cross off the numbers used in that bet, meaning the first and last 1 would be crossed off and you would shift to the next first and last numbers. If that hand results in a loss, the system requires you to take the amount of units lost and add the number to the end while also not crossing off the numbers used in that bet. Now you would use the first available number again and add it to the losing number, which would be a bet of 3 unit. If you win, cross them off, if you lose, add the amount of lost units to the end of the row. The martingale system is simply a double up on losing hands system, which means each time you lose, you would double up. Start small when using the system, such as £1 bets and shift to £2 bets if you lose. Each losing hand would be double of the last, for example, 1, 2, 4, 8, 16, 32, 64, and so on. However, when you win, return back to the lowest bet and pocket your profits. To use this system, you would need to ensure table limits allow at least 10 double-ups and your account balance would allow for these double ups. Also, do not change the value of your wager amount at all while progressing as you would lose if you decrease the amount at all, and your values would increase a lot faster if you increase the bet at all.